I am a Ph.D. candidate at the University of Florida and the Florida Museum of Natural History. My research interests are in conservation paleobiology, using the modern and fossil molluscan records to better understand the historical ecology of ecosystems in order to make better targeted restoration and conservation goals. My current projects span from freshwater systems in Florida to Hawaiian reef environments, studying the impact various anthropogenic and environmental factors have had on community composition through time. I am a Ph.D. candidate at Yale University studying taphonomy and paleobiology under the guidance of Dr. Derek Briggs. Taphonomy is my primary interest, particularly the preservation of terrestrial cuticle. I am working on a number of projects related to this field, including evaluating rates and patterns of disarticulation in Gecarcinid (land) crabs; examining the preservation of structural and pigment-based colors in insects; and elucidating major controls on the exceptional preservation of plants. My thesis is focused on this last topic – leaf preservation – and I am using integrative experimental and fossil based approaches to answer various questions within this field. Your voluntary contributions help substantially to advance the science of paleontology, to expand our knowledge of lost worlds! Thanks so much for your support! It is greatly appreciated. Don’t delay! Enjoy the benefits of Paleontological Society Membership. Already a Paleontological Society Member? RENEW your membership now for 2019 and continue to enjoy the Society’s benefits. The Paleontological Society is an international nonprofit organization devoted exclusively to the advancement of the science of paleontology through the dissemination of research by publication and meetings. Pollen morphology at the K-Pg boundary - work by PS Member Damian Cardenas and colleagues! (2019). Morphologic variation of two key biostratigraphical proteaceous-like pollen taxa across the Cretaceous–Paleogene boundary in northern South America. Grana. Ahead of Print. Calling all Paleontological Society Members! We want to share the great work you're doing in our field. In order to help us do that, we'd love for you to share a link to a recent paper, article, or other media pertaining to your work. Let us broadcast for you! Use this form to submit any recent articles, papers, or other media pertaining to your work. We would love to share it! Incredible work by Paleo Society members - rewriting the way we think about Cambrian fossils! Take a look at the wonderful preservation! Did you know you can have Open Access fees waived, if your article is selected by the Paleobiology editorial board? The Geological Society of America (GSA), American Geosciences Institute (AGI), American Geophysical Union (AGU), GSA Geobiology and Geomicrobiology Division, the Paleontological Society, and the Society of Vertebrate Paleontology (SVP) will be hosting a webinar entitled “Exploring a Career in the Paleontology Field.” The webinar will be on Wednesday, 24 April 2019, at 11:00 a.m. MDT. This webinar will feature two presenters representing mitigation and federal paleontology careers. Speakers will provide information on the typical daily activities, how to prepare for a career in this field (including curriculum, resume, and interview tips), common career trajectories of the profession, and where to find these career opportunities. Please click here to download the flyer. ReBecca Hunt-Foster is the new Monument Paleontologist and Museum Curator at Dinosaur National Monument. Mathew Carson is a Senior Paleontologist at Paleo Solutions, Inc.
WASHINGTON, D.C. – U.S. Senators Kamala D. Harris (D-CA), Jacky Rosen (D-NV), and Richard Blumenthal (D-CT) on Thursday announced the Combatting Sexual Harassment in Science Act of 2019, legislation to provide for research to better understand the causes and consequences of sexual harassment in science, technology, engineering, and mathematics (STEM) fields, examine policies to reduce harassment, and encourage interagency efforts in these matters. This bill follows a landmark report from the National Academies of Sciences, Engineering, and Medicine, which found that sexual harassment is pervasive in institutions of higher education and contributes to loss of talented, highly-trained individuals in the STEM workforce. The Combatting Sexual Harassment in Science Act is the Senate companion to legislation introduced in the House of Representatives by Rep. Eddie Bernice Johnson (D-TX) on January 3, 2019. · Create a new grant program through the National Science Foundation (NSF) to better understand the factors contributing to, and consequences of, sexual harassment, and examine interventions. · Direct Federal statistical agencies to gather national data on the prevalence, nature, and implications of harassment in higher education. · Direct NSF to enter into an agreement with the Academies and update professional standards of conduct in research, evidence-based practices for fostering a climate intolerant of harassment, and methods for identifying and addressing incidents. · Establish an Interagency Working Group for the purpose of coordinating Federal science agency efforts to reduce the prevalence of sexual harassment involving grant personnel. · Authorize $17.4 million a year to carry out the Act, following recommendations by NSF and the National Academies of Sciences, Engineering, and Medicine. Supporters of the Combatting Sexual Harassment in Science Act include The American Chemical Society, American Educational Research Association, American Geophysical Union, American Mathematical Society, American Physical Society, American Physiological Society, American Political Science Association, American Psychological Association, American Society for Microbiology, Association for Women Geoscientists, Association for Computing Machinery’s Council on Women in Computing, Association for Women in Mathematics, Computing Research Association, Consortium of Social Science Associations, Endocrine Society, Federation of Associations in Behavioral and Brain Sciences, Santa Barbara Women’s Political Committee, Society for Personality and Social Psychology, Society of Women Engineers, The Optical Society, The Paleontological Society, and the Association for Women in Science. In addition to Senators Harris, Rosen, and Blumenthal, this legislation is co-sponsored by Senators Hirono (D-HI), Klobuchar (D-MN), Peters (D-MI), Reed (D-RI), Sanders (I-VT), and Smith (D-MN). The 2019 edition of the workshop will be hosted at the University of California, Riverside (USA) immediately following the 11th North American Paleontological Convention (NAPC: napc2019.ucr.edu): FRIDAY JUNE 28 thru TUESDAY JULY 23, 2019. To submit your application, please visit www.analytical.palaeobiology.de. Applications and recommendation letters are due on March 15, 2019. Admission decisions will be made in early April 2019. The workshop is free for admitted applicants and lodging will be provided at little or no cost to all participants. Financial aid to assist participants with travel costs may be available, but we encourage applicants to pursue additional funding at their home institution or other sources, particularly in association with NAPC. This 4-week workshop, with major support from NSF, aims to introduce graduate students to a range of analytical methods that are foundational to or at the cutting edge of paleobiological research. Topics, taught by rotating expert instructors, will include probability theory, maximum likelihood and Bayesian methods, resampling techniques, correlation and regression, multivariate statistics, methods of measuring biodiversity, morphometrics, phylogenetic methods, spatial and time-series analyses and other related topics. The workshop will also provide practical hands-on training in statistical programming and data analysis and visualization in R.
PhD students from any degree-granting institution worldwide are eligible for admission. Applications from junior scientists who completed their PhD recently and from future PhD students (i.e., advanced undergraduate students and MS students interested in research-oriented careers in paleontology) will also be considered. Maximum enrollment is 15 students. Admission decisions will be based on student applications and recommendation letters. Special consideration will be given to students who plan on attending NAPC prior to the workshop. To learn more about the workshop, please visit the website at www.analytical.palaeobiology.de. If you have questions about the workshop or the application process, please email Shanan Peters (peters@geologywisc.edu) or Seth Finnegan (seth.finnegan@gmail.com). Introducing the AWG Undergraduate Excellence in Paleontology Award! The Association for Women Geoscientists is pleased to announce the AWG Undergraduate Paleontology Award. The award, which consists of a $1000 cash prize and membership in the Paleontological Society and AWG for the tenure of the awardee’s schooling, will be presented to an outstanding female undergraduate student pursuing a career in paleontology. This award was made possible by the generous donations of David Watkins and Mary Anne Holmes. All application materials must be received by April 15. The winner will be notified in May and the award will be distributed in early summer. A. Applicants must be women pursuing education as an undergraduate student in the paleontological – and affiliated – sciences at a degree-granting institution. B. Applicant must be enrolled as a student during the period of the award. C. Proof of student status in the form of transcripts (official or unofficial) must be provided. D. Successful applicants will exhibit exceptional motivation, professional potential, outreach, and long-term commitment to goals. E. Students may receive the Undergraduate Paleontology Award only once during the tenure of their undergraduate careers. F. No prior AWG or PS membership is required. G. National or international students are allowed to apply, with the exception of sanctioned countries. Website Cameleon can help make editing a website easy and SEO features built in! The event is in a few days and we have cookies! If you would like to join the fun, please RSVP by email to the address on the main post soon! Calling all PS Members! Do you have a recent article, paper, or other media based on your work that you'd like us to share? We want to broadcast it for you! 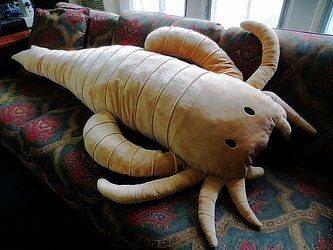 We are taking orders again for our Giant Eurypterid Body Pillow. Supplies are limited, so please order soon! Website by Rave Communications, Inc.